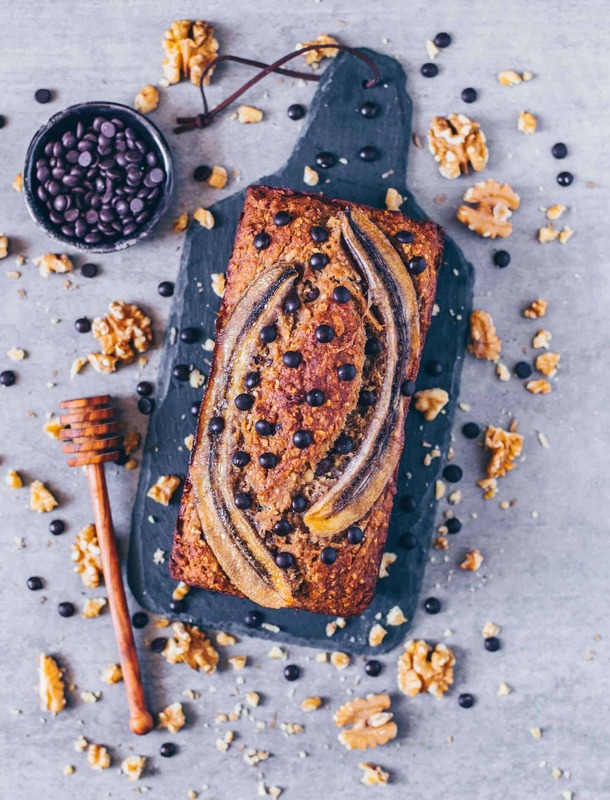 The classic vegan banana bread! Are there actually people out there who don‘t like it? I have always loved it myself. Whether for breakfast, as an afternoon snack or as a simple dessert with some peanut or almond butter on it. 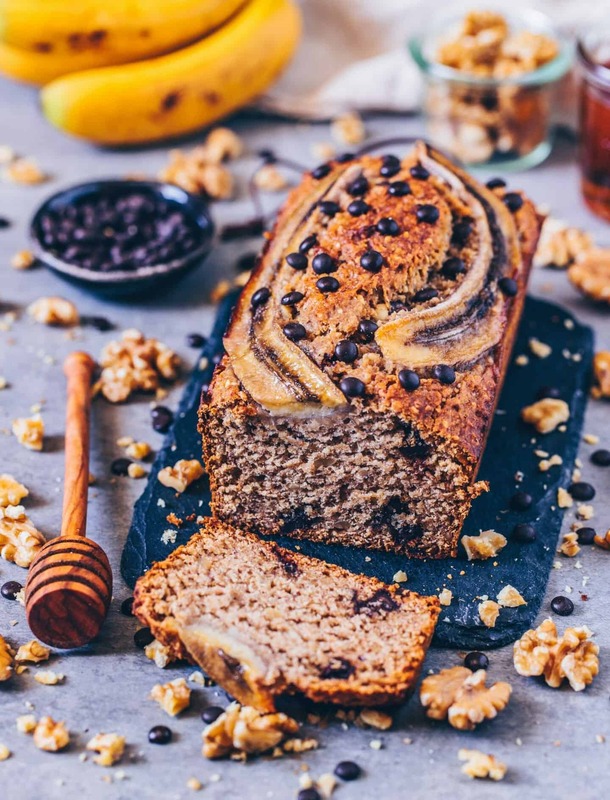 It doesn’t matter which time of the day, vegan banana bread is always perfect and it’s one of my favorite sweet and healthy treats. 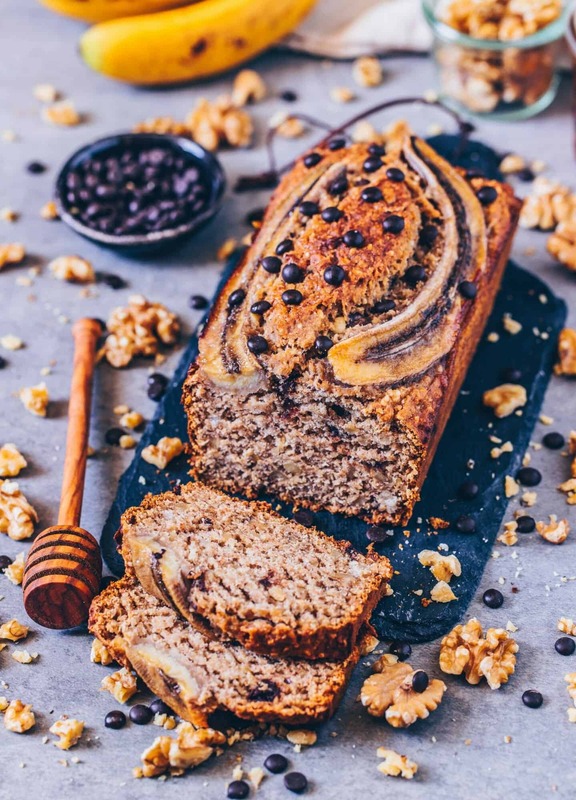 Vegan banana bread is easy and quick to make! The preparation time is incredibly fast and you only need one bowl. The dough literally comes together in less than around 5 minutes. Then the vegan banana bread only has to bake for over an hour and afterwards just cool. If you bake the bread in the morning, you can already enjoy it by lunch time. But it’s also great for freezing, so you can prepare it in advance and just defrost when needed. Quick toasted up, it tastes like freshly baked gain. To freeze it, I wrap the vegan banana bread simply in baking paper first and then pack it in a freezer bag closed with a clip. You just need a few ingredients! I baked this vegan banana bread with whole-grain flour and some fine oats. Therefore, it is a bit more compact, because full-grain is heavier than light flour. When you prefer a fluffier bread, I recommend using light flour. Usually, I always prefer spelt, because I like the nutty, healthy taste so much. Wheat has the same baking properties, so it works the same. Of course you can also make a 50/50 mix of the flours / oats. And so that the dough is not too dry and nicely moist, the addition of healthy fat (vegan butter or coconut oil, as well as nuts or nut butter!) is also very important in this recipe. Because that’s crucial for the addition of moisture. If you decide to try out another combination (which works for you), please let me know in the comments below, and I can update the recipe notes. 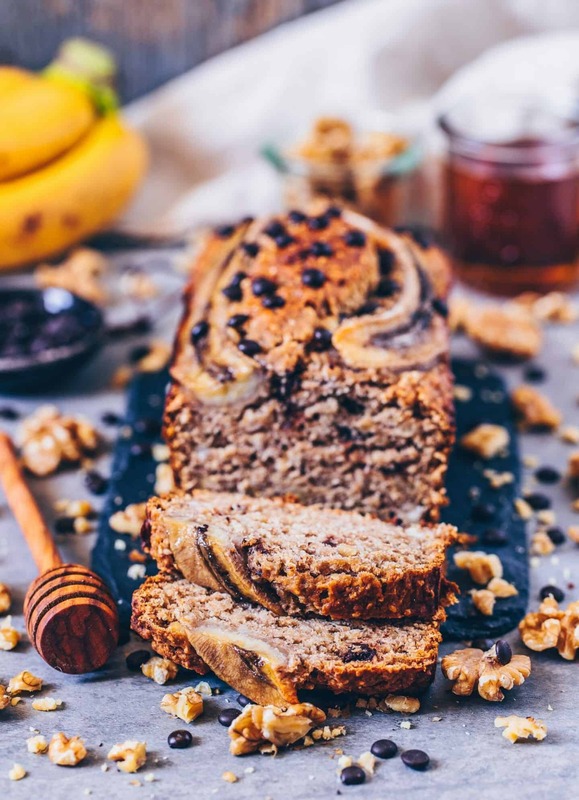 Vegan Banana bread – naturally sweetened! Thanks to the natural sweetness of bananas, you don‘t need so much extra sweetness. I chose maple syrup, but if you don‘t have maple syrup at home or prefer something different, you can of course also use agave syrup, date syrup or simply organic cane sugar, coconut blossom sugar or plain white sugar. Since everyone likes different sweetness, I recommend trying the dough before baking, if it’s sweet enough for you. If you tried the recipe, I would appreciate a comment. You are also welcome to post a picture on Instagram and link it to @biancazapatka so that I can see your great creations. ? 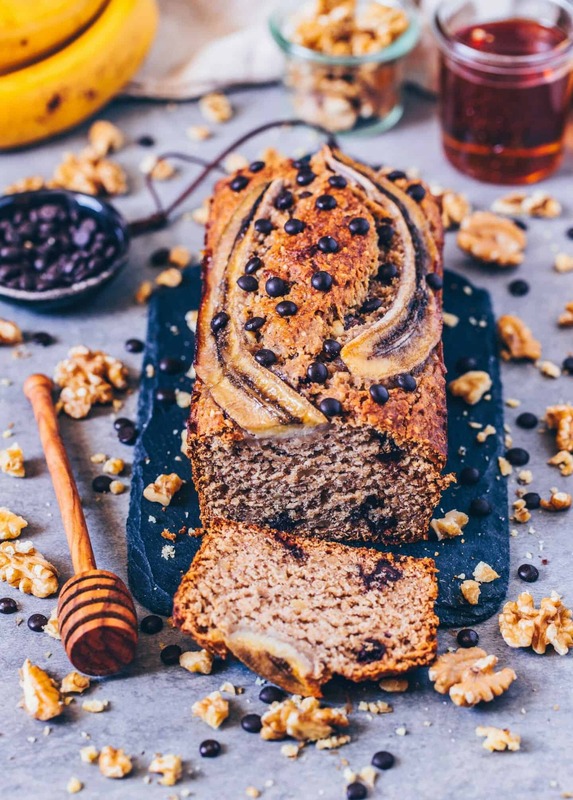 This vegan banana bread is healthy, whole-grain, naturally sweetened and absolutely delicious. It's easy to make and the dough is mixed in only 5 minutes! So it's done very quick and you just need a few ingredients! Preheat the oven to 180°C. Grease a 20 cm loaf pan with oil and set aside. Mash the bananas in a large bowl until smooth and mix with all other wet ingredients (plant-based milk, melted coconut oil, maple syrup, apple cider vinegar). Then crush the walnuts and cashew nuts and mix with the other dry ingredients (oats, whole-grain flour, baking powder, cinnamon, salt) in the wet mixture until well combined. Fill the dough into the loaf pan and spread out evenly. Halve the banana, place it on the dough, lightly press and drizzle with some maple syrup. Bake the bread uncovered for 30 minutes. Then reduce the heat to 150°C and bake for another 20 minutes. (If it gets too dark, you can cover with baking paper or tin foil). Allow to cool for approx. 30 minutes and then carefully remove from the loaf pan. Once the bread has cooled, you can garnish it with more chocolate chips if you like. The bread will keep wrapped in the fridge refrigerated for about 3-4 days, or it can be frozen for 4-6 weeks. To sweeten you can also use coconut blossom syrup, date syrup, agave syrup, brown cane sugar or normal white sugar. Instead of oats, you can also use more flour. If you prefer a fluffier bread, I recommend to use a light flour (such as spelt flour) instead of oatmeal and whole-grain flour. The type of nuts can be chosen as desired. You can also use f.ex. sesame seeds or other. I would love to have a slice of this right now with my afternoon tea Bianca!!! Looks and sounds so scrumptious! Thank you ! Would love to share with you! Maybe you‘ll try the recipe one day. ? I can’t wait to try it since I’ve never had banana bread before! Thank you so much for your lovely comment. So glad, that you like my pictures. I hope you’ll enjoy the banana bread! So glad that you like banana bread and that you’ll try my recipe. I used two large ripe bananas. It was about 280 g totally. 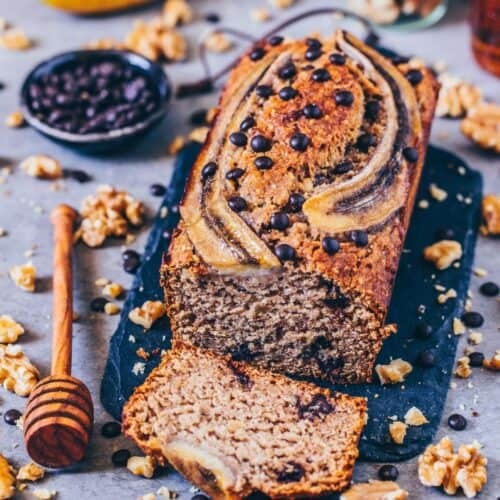 This recipe seems so delicious.I have only 3 more days until summer holiday and looking forward to trying all of your recipes?.Just need to buy appropriate pan for banana bread?. It would really be helpful if you could tell me how did you learn to take these amazing photos with such a good background? Thank you so much for your lovely comment! I‘m happy to read that you would like to try my recipes ? Yummy recipe! 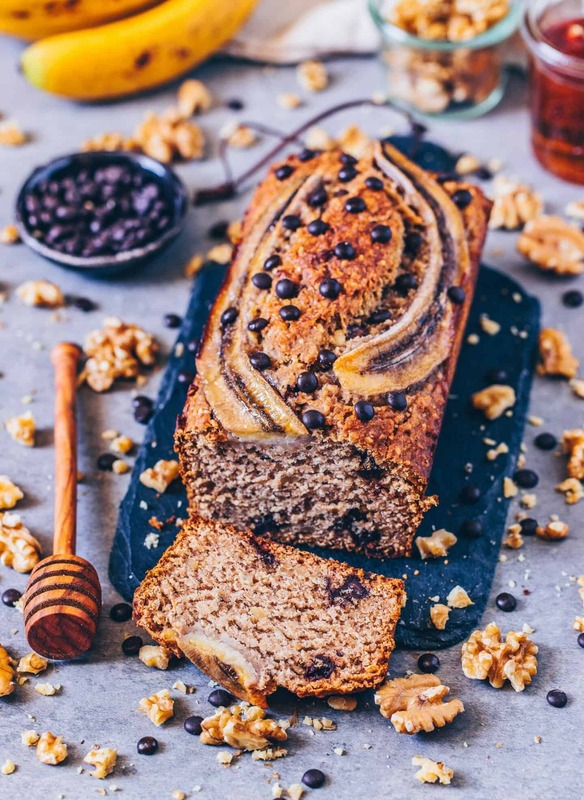 This is very interesting as I have never heard of it before so after reading your post I am very curious to make it for my family so that they can enjoy this tasty banana bread. Keep sharing such unique recipe ideas. This recipe is really one of my favorites. I hope you‘ll like it, too! This was definitely the best banana bread I’ve tried! Since I’m celiac, I used grounded almonds instead of oats! It’s so yummy and the consistency is perfect!! Recommend it! 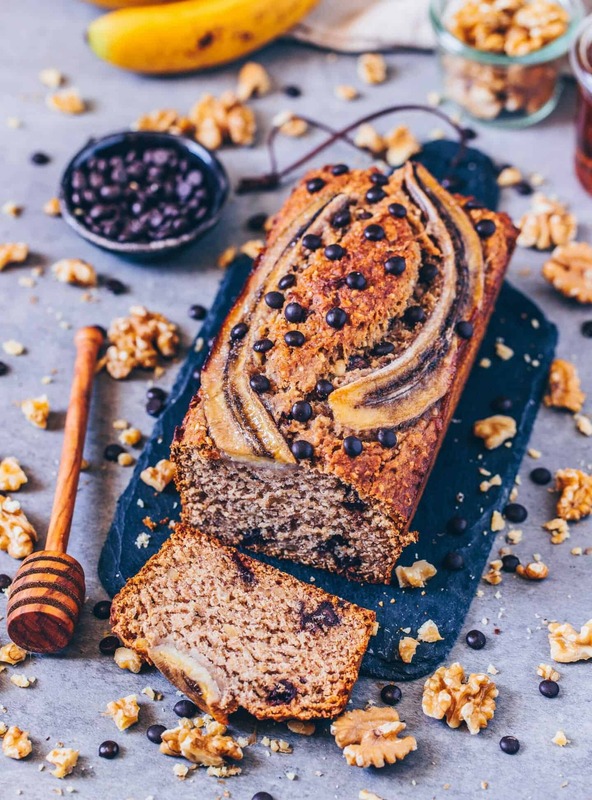 This budget-friendly banana bread is certainly one of the most delicious I’ve ever tasted : the nutty and chocolatey flavours and the moist texture have a lot to do with it ! I could eat it for breakfast, snack or dessert… A great taste experience ! Hi Bianca! Made this banana bread this afternoon and I love it! Easy and delicious! 😍 Perfect to eat with my tea. I’ve made this recipe 5 or 6 times and it always turns out so delicious! I tried yesterday a banana bread in some café and now I was looking for a recipe by you of banana bread and I’m so happy I found it!! I’m just curious about the apple cider vinegar, what is it bringing to the cake? I’m looking forward to try it!! The apple cider vinegar helps the baking powder to react, making it a little “fluffier”. So I finally did this recipe today and I have no words, it’s just so delicious!! When I was putting the maple syrup I was scared that it would be too sugar loaded but finally when I tasted the batter it was perfect, and so is the cake! I didn’t have walnuts so I put just 4 tbsp of cashew nuts, and it’s still very good!! As I said, I tried it in some cafe but here is even better 😍 so thank you very very much for your recipe!! Looking forward to try other recipes from you!! Thank you very much for this easy and tasty recipe! So DELICIOUS. This looks lovely 😍will definitely use this recipe. 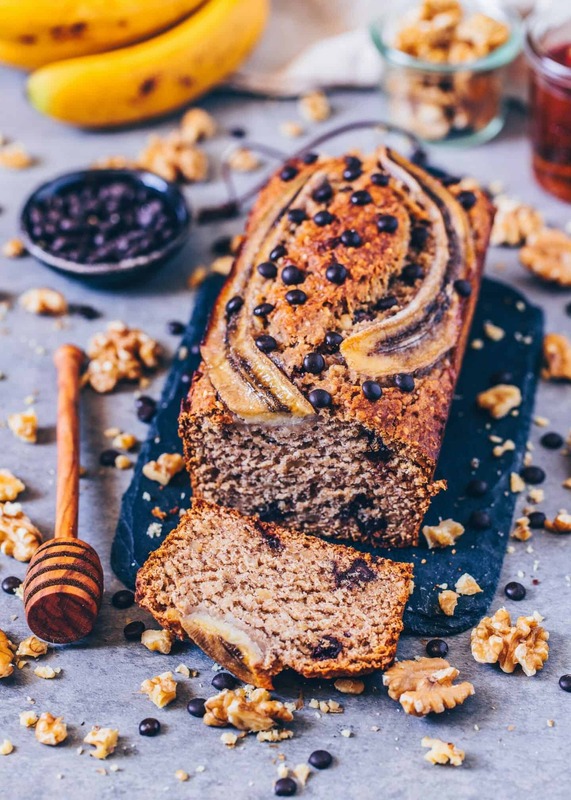 I thought that was blueberries in this bread, only after reading the recipe I saw it’s chocolate chips 😂 I would really like to make a banana bread with blueberries. To you think I can just use this recipe with a cup of blueberries covered in cornflour?